This is my favorite place in Sevilla and it is 100% free each and every day. The area was built for the 1929 World's Fair and has been enjoyed by locals and visitors ever since. Take time exploring every level of the Plaza and if you want, grab a perch in an archway and claim it as your own personal reading nook. In the park, wander along the many pathways looking for the orange groves, intricately tiled fountains, and ponds filled with ducks. There are plenty of open spaces as well as little hideaways, so whether you're looking to lay out in the sun or hole up in a secluded spot, you'll be able to find what you're looking for. Alright, so entering the cathedral is not free, in fact, at 9€ it's actually quite expensive, but observing the cathedral from the outside is free and in the morning, it's the most peaceful activity in which you can partake. If you can make it to the area before 9AM, it'll just be you, the cathedral, and the horse and carriages getting ready for the day. 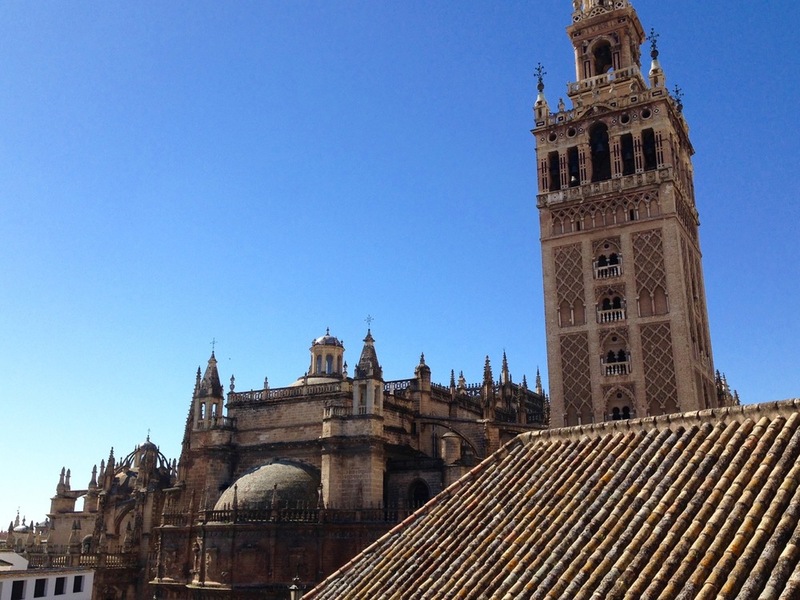 As a cheap additional viewpoint, there's a great lookout to the Giralda bell tower from the Doña Maria hotel's rooftop terrace. A drink at their bar will run you anywhere from 4€-11€, so if you just want a caña this can actually be a really cheap way to relax with a great view. Las Setas translates to The Mushrooms and it's a huge wooden structure consisting of seven different parasols that was plopped down in the middle of Sevilla in 2011. It's free to look at and you can also visit the first level for free. If you're willing to part with 3€ you can visit the upper deck that it seems very few people know about. To access the area you will counterintuitively walk down to Level 0 where you will buy your ticket and take the elevator up to Level 3. From the “rooftop” you'll have some of the best views of the city, so make sure to bring your camera. Your entrance is 3€, but with your receipt you'll get a ticket for a free drink at a number of restaurants on the ground level of the Parasol and once you've gone up and come back down you can exchange your receipt for a postcard. So this is basically the best deal in Sevilla. Nearby, if you want to do some window shopping at cute boutiques, head up Calle Regina to have your fill (hint: the street will lead you up to the Feria Market - the next entry on the list). A cheap way to eat and a fun way to get to know the city is to visit the central markets of each of Sevilla's neighborhoods. My two favorite were the Triana Market and the Feria Market in the Macarena district. Triana's Market is the newest and you can tell immediately upon entering. There are wide open aisles between the stands, bright lights, and sit down restaurants scattered throughout. The Feria Market, on the other hand, is the oldest and feels much different. Its stands are crowded around narrow alleyways and you can't tell what's being sold until you're standing in front of the vendor. Both spots will give you exposure into the local life and they're also cheap places to eat, whether you're grabbing groceries or sitting down to be served. I highly recommend stopping at La Cantina on the edge of the Feria Market for the freshest seafood in the city fried up at unbeatable prices. 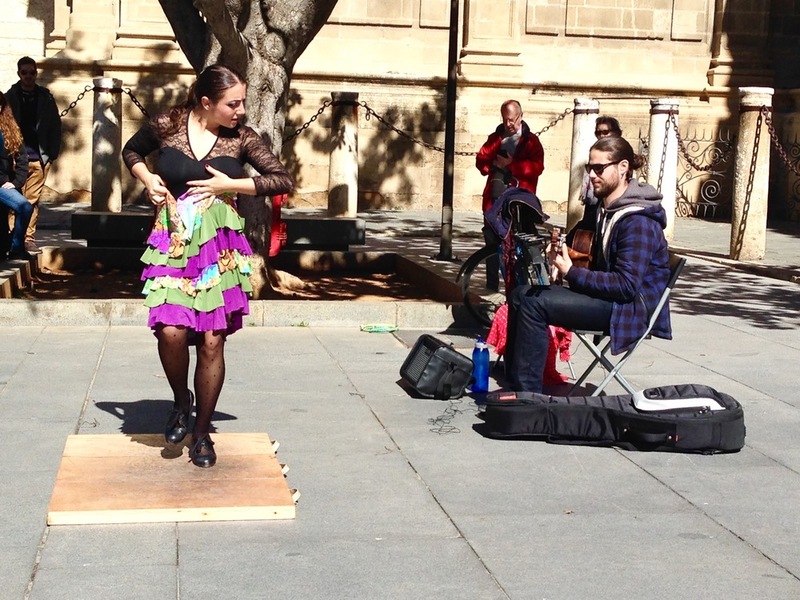 One cannot visit Sevilla without attending at least one flamenco show and luckily for you, there are many establishments that offer “free” shows (though most expect you to purchase at least one drink). The most famous of these establishments is La Carbonería (Levíes, 18 Sevilla , 41004) which is a former coal warehouse that has been transformed into a pseudo dining room. It's filled with long tables and benches and as the music starts everyone crowds in around the small corner dance floor. They're open 8PM-2AM and dancing starts between 9:30PM-10PM. At La Carbonería they're not pushy with drinks, so you can partake in as much or as little as you wish. They don't allow pictures, which is a bummer, but you've got to be respectful of the rules. For an experience across the river, the most well known spot is Casa Anselma. They open around midnight and you'll also get a free show, but with a slightly pushier hostess (Anselma herself). If you want to get away from the shows that everybody knows, head to Triana, follow your ears, and you'll be sure to find something great. 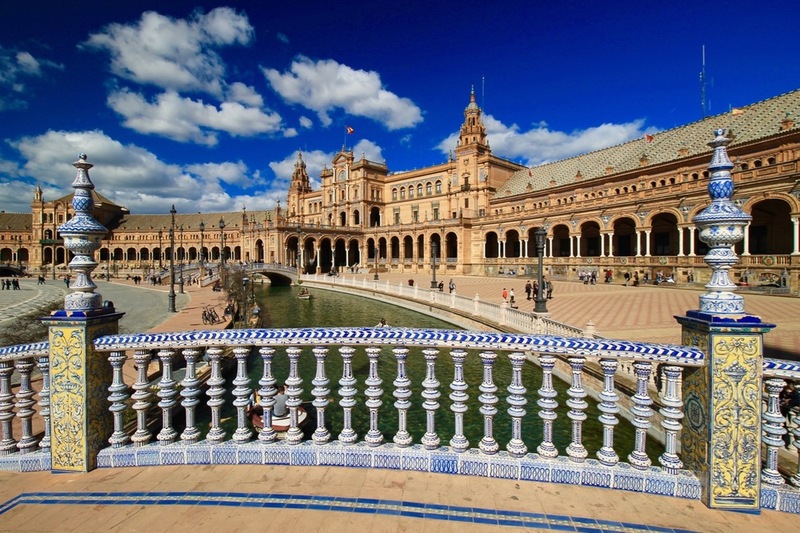 Alright, so the above are always cheap or free activities in Sevilla, but there are also lots of free times and days to access the city's many museums, churches, and monuments. When I visited, all I wanted was a list of the free activities by the day, but I couldn't find it anywhere. So of course, I've made it for you. You're welcome. E-mail reservas@catedraldesevilla.es with the full name of each person requesting a ticket at least one week in advance. Limit 750 people, so arrive early to get in line. E-mail reservas@palaciodelebrija.com to make your reservation in advance. I hope you enjoy your visit to Sevilla! Let me know how it goes!